is the official journal of the Society of Teachers of Family Medicine, and its source for Family Medicine Recruitment Advertising. It is designed for educators from a variety of different backgrounds in family medicine education. This publication reaches approximately 5,000 family physicians, psychologists, sociologists and public health specialists. These loyal readers turn to this publication for the latest information in their field including, family medicine research and commentary on medical education. Recruit medical faculty and medical researchers in the Employment Opportunities section. 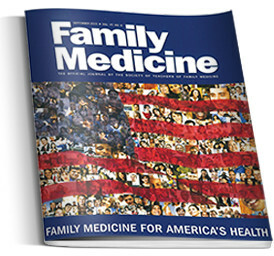 Medical Education advertising for this targeted readership of family medicine educators, researchers and practitioners is available. Business and education products and services are featured under a category heading. This trusted publication provides a credible advertising environment for Recruitment, CME, product and service advertising. This publications provides advertising in both classified word and display format. Interested in online medical faculty recruitment advertising? For additional advertising resources, employers and other advertisers can turn to the Family Medicine Careers job board which is the official online job board journal of the Society of Teachers of Family Medicine. My customer experience with Kim Ridgeway, Senior Media Sales Associate with Russell Johns has been excellent. She is a great listener, listening intently, asking questions, and demonstrating she cares and wants to provide the right advertising solutions. She has proven to be very honest and transparent, resulting in my opinion that she truly cares about the customer’s happiness and satisfaction. In one search, my department was required to change issue dates, and Kim and her team showed great flexibility and adaptability and promptly adjusted to new expectations. On a more personal level, Kim conveys a friendly and caring demeanor while maintaining a high level of professionalism. Finally, she has consistently responded to my communications promptly. For all these reasons, we have been extremely satisfied working with Russell Johns! What publications are you interested in? What type of ad is this?